Let the good times roll year round with a Mardi Gras themed jazz Brunch Cruise down the mighty Mississippi. Explore the decks and let the sights and sounds of the French Quarter entice your senses, the Riverboat CITY of NEW ORLEANS will stop briefly at the infamous Mardi Gras World - where you will have the option of disembarking for a tour of where Mardi Gras is made. 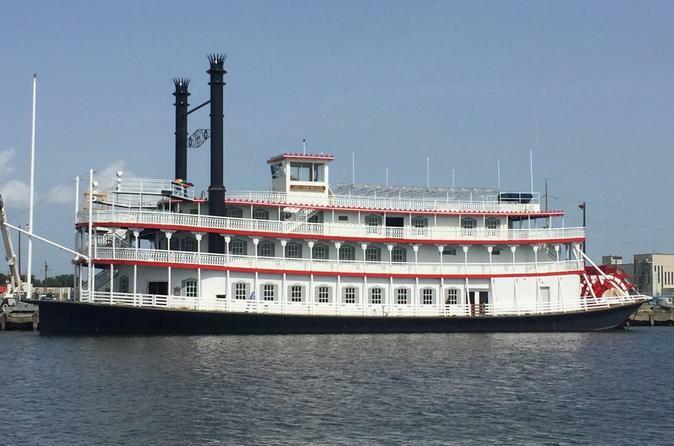 Riverboat CITY of NEW ORLEANS will return to the French Quarter for a roundtrip cruise. Indulge in a selection of quintessential brunch options as the sounds of jazz fill the majestic riverboat. Adorn yourself with a Mardi Gras bead and join in that number as you partake in a festive second line parade, before departing for an optional upgrade tour of Blaine Kern’s Mardi Gras World. Learn more about New Orleans Carnival tradition and see it come to life, watching artists craft the stunning floats that captivate eager revelers each Mardi Gras. Meet at the lighthouse ticket office on the riverfront in the historic French Quarter before boarding the newly remodeled Riverboat CITY OF NEW ORLEANS. Receive your complimentary Mardi Gras bead upon boarding as you are seated at your table in the main dining room. Enjoy live jazz and the captain’s narration from the comfort of our elegantly renovated dining room, or make your way out to the deck for picturesque views of the shoreline scenery. End your Mardi Gras experience with a celebratory second line parade lead by the house band before guests who purchased the optional Mardi Gras World tour disembark. With this upgrade, guests will get up close to the artists as they build the floats that will eventually make their way down St. Charles Avenue. The 45-minute tour departs at 1:00pm. Jazz Brunch Cruise guests will return to the departure point at the Bienville Street wharf in the French Quarter with plenty of time left to explore the Big Easy! Special Offer - Book and save 28% compared to the local supplier's prices! - Book Now!